An elasticated Freshwater pearl bracelet with a Swarovski crystal set shambala bead and 2 pairs of earrings which consist of a pair of pearl and sterling silver earrings and a pair of Swarovski crystal set shambala sterling silver earrings to match too depending on the occasion. Silver & Green Amber Pendant, Chain & Earring Set in a Celtic Design. Chain length 18 inches (45.5cm). Pendant 3.5cm. Earrings 3.5cm drop. All measurements approximate. 925 stamped. I think this set was originally from NEXT, but there is no original packaging. It has had very little wear and is in good used condition. Stimulated Pearl necklace & earring Set Charmin 8-9mm White Akoya . Dispatched with Royal Mail 1st Class Large Letter. 9ct Gold Necklace and Earring Swarovski Crystal Ball Set FOR £127. 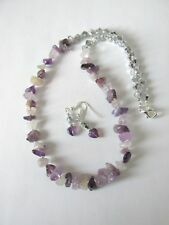 Beautiful Mina work pendant & earrings set . Please go through the photos & any questions please ask. This high quality, beautiful sterling silver pendant necklace and earrings set would make a perfect gift for anyone to show them how much they are loved or for a bride. The pendant and earrings features a pretty heart shape with eight cubic zirconia stones and three rings in gold, rose gold and silver colours. Natural Baltic amber set with big, easy to use metal clasp which is not only elegant but also protects from loss. Both bracelet and necklace are made of raw, irregular, polished stones in exceptional honey and white colours. Naturally shaped amber stones are placed on linen strings and separated from each other. .
Pendant and Earring set. 9ct Gold Lilac CZ Star Pendant and Earring Set. Complete with 9ct gold 18" Prince of Wales chain. All fittings are solid 9ct gold. This does not affect your statutory rights. Beautiful set for a gift. Condition is Used. Beautiful set, the necklace can be worn as 16' or 18'. Have a ring in size M with a garnet stone and parrot necklace. Sterling silver set. Listed as used, because worn once. Very pretty set with daisy design Set consists of earrings, pendant and a ring. Ring is size N All items hallmarked 925. UK bidders only please. Happy bidding. This is a 9ct yellow gold pendant and earrings set. They have facet cut iridescent hearts. The hearts have been enhanced for colour by adding a foil layer on the back. The earrings hand on hoods with a diamond shape on the front. MAJORICA LADIES PEARL NECKLACE AND MATCHING MAJORICA PEARL EARRINGS FOR PIERCED EARS. BEAUTIFUL GIFT. Armani necklace Sterling Silver Authentic from Goldsmiths . Condition is Used. Dispatched with Royal Mail 2nd Class. New listing925 silver sun design set, NEW!. Cute square shaped set with sun design. Pure Origins Heart Necklace And Earring Set Sterling Silver. Never been worn. Classic, elegant set of earrings and vintage pendant. This particular set is made of natural Baltic amber in a unique green and black colours and sterling silver (.925) finish. The perfect combination of a classic beauty of amber and simplicity of sterling silver..
Sterling silver set with stones. New - never worn. Set consists of earrings, pendant and a ring. Ring is size P. All items hallmarked 925. UK bidders only please. Happy bidding. The set comprises of a large, heavy cuff bracelet, a pair of Drop Earrings and a pendant and chain. Created in hallmarked solid sterling silver with a heavily oxidised creased pattern. 925 Silver "Hot diamond" pendant and earring set. This is a solid weighty item Condition is Used. Dispatched with Royal Mail Signed For® 2nd Class. Genuine gemstone Shell Cultured Pearl bracelet, made from white, pink, blue, yellow and silver shell pearls. These are all 8mm rounds. ( just over 4 cm). The shell pearls have been sourced from China. This attractive Freshwater pearl sethas never been worn and comprises of an 18" necklace and earrings for pieced ears. This handcrafted piece of jewellery has a certificate of authenticity and quality. This luxurious matching set includes a real sterling silver 22mm x 12mm Pendant and 45cm (18") chain, earrings and ring (size N). Simply stunning. Beautiful earrings and necklace worn once. A bit like Monica vinader style. 925 silver, gold vermeil.